B.B. King's real name is Riley B. King. He was born in 1925 in Itta Bena, Mississippi, and he moved to Memphis in 1947. His first major radio appearance was in 1948 on the West Memphis, Arkansas station KWEM. After that he began appearing on the Memphis radio station WDIA where he later worked as a D.J. During his time at WDIA, he earned the nickname "Beale Street Blues Boy", which was eventually shortened to "B.B." The name stuck. Sam Phillips, one of Memphis' most prominent and influential music producers, produced some of B.B. King's early work. He hit number one on the Billboard Rhythm and Blues Chart in 1952. The hits continued into the 1950s. B.B. 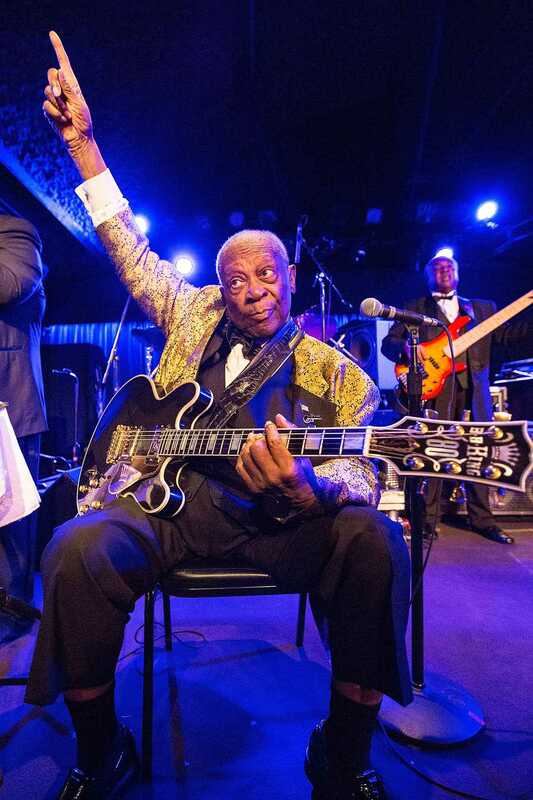 King was inducted into the Blues Hall of Fame in 1980 and in the Rock and Rock Hall of Fame in 1987. He was a prolific performer even as he reached his 70s. He passed away on May 14, 2015 from heart failure and complications from diabetes; he was 89. Memphis marked his passing with a funeral procession down Beale Street. He is buried at the B.B. King Museum in Indianola, Mississippi. There is no better place to experience the legacy of B.B. King than Memphis' Beale Street. The B.B. King chain of restaurants has its original location in Memphis at B.B. King's Blues Club at the corner of 2nd Avenue and Beale Street. There are several other locations in Los Angeles, New York City, Nashville, Orlando, West Palm Beach, two in Connecticut, and another Las Vegas. The Memphis club offers plenty of barbecue and Southern food and live blues and rock music every single day. B.B. King's Blues Club was named the Best Bar For Music in 2016 by the local newspaper the Commercial Appeal. Above B.B. King's Blues Club is the semi-hidden Itta Bena restaurant. This restaurant is a quiet, romantic spot to escape the bustle and activity of Beale Street. Itta Bena is more upscale, offering a fine dining menu and mood lighting. B.B. King has a Brass Music Note on Beale Street as well. The Beale Street Brass Notes Walk of Hame commemorates 150 individuals who contributed to Beale Street through their work as musicians, entertainers, producers, or promoters. Another place to learn about this legend is the B.B. King Museum in Indianola, Mississippi. I tells the story of B.B. King's life along with the era in which he was famous. You'll learn about the rise of blues music, the Civil Rights movement, and social change in the Mississippi Delta. You'll also hear rare recordings by the musician and see artifacts only stored here. The Museum is open Sundays and Mondays from noon to 5 p.m. and Tuesdays through Saturdays from 10 a.m. to 5 p.m. Adult admission is $15, seniors $12, and students and youth are $10. What Is the New Madrid Fault Zone?